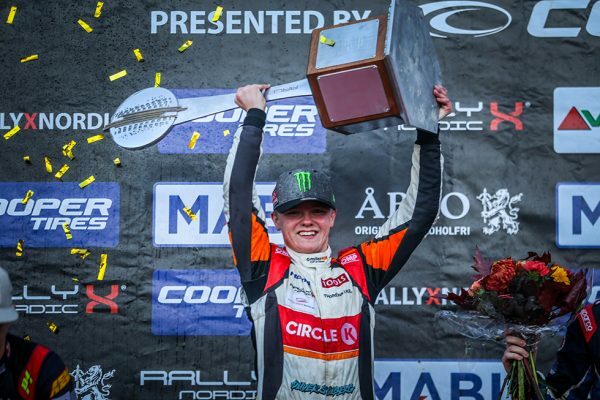 Oliver Solberg has been crowned the 2018 RallyX Nordic presented by Cooper Tires Supercar Champion after resisting the pressure of his title rivals to prevail in fine winning style at the Tierp Arena. 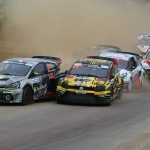 In front of 7,700 spectators, Solberg recovered from seeing his championship advantage whittled down to four points by Oliver Eriksson coming into the all-important final to power to a critical third victory of the season as his title rivals floundered. Solberg, Eriksson and Thomas Bryntesson had come to the Tierp Arena each with an opportunity to leave with the RallyX Nordic trophy and the challenge of the all-new Swedish venue proved a successful leveller as the trio fought for supremacy over the an eventful weekend of rallycross action. Each title contender picked up a qualifying race victory apiece but Bryntesson topped the Intermediate Classfication after staying largely out of trouble, unlike Solberg who suffered a puncture in Q2 and suspension damage in Q3 on his OSRX Citroen DS3 to leave him only fifth at the midway stage. With Eriksson second on the classification, despite a DNF in Q3 following contact off the start, both the Swede and Bryntesson reduced Solberg’s advantage to three and eight points respectively. Come the semi-finals though and it was JC Raceteknik’s Bryntesson’s turn to face misfortune when a puncture forced him out of both race and title contention, in turn promoting Solberg into a lead he’d retain to the chequered flag. When Eriksson could only manage second in the semi-final that followed after suffering his own technical issues, Solberg’s margin was reinstated to four points. Starting the final from the front row, Solberg got the start he needed before surviving the jostling into the turn two hairpin to secure the lead. Eriksson’s title challenge came to an end just seconds later when his attempts to get in front of Andreas Carlsson resulted in contact that forced him into the barrier at turn four. Despite his valiant efforts to get going again, Eriksson was forced to park up soon after to officially concede defeat in the title battle. Passing the stricken Olsbergs MSE Ford Fiesta on track, 17-year-old Solberg – son of two-time World Rallycross Champion, Petter – knew the championship was decided regardless of the result but he’d keep it neat and tidy nonetheless to take the chequered flag as a winner for the third time this season and, most importantly, as the new RallyX Nordic presented by Cooper Tires Champion. Robin Larsson marked his return to RallyX Nordic competition by avoiding drama to claim second position in his Audi A1, while Philip Gehrman secured a third podium in four starts in his Eklund Motorsport Volkswagen Beetle. Damaged from his incident with Eriksson, Carlsson nonetheless managed an equal-best finish of fourth place in his Renault Clio. Elsewhere, Nysum winner Ulrik Linnemann showed impressive pace driving the Olsbergs MSE Honda Civic – which was making its European competition debut – but broken suspension in the semi-finals halted his progress, much like Lukas Walfridson (Helmia Motorsport), Ola Froshaug (JC Raceteknik) and Peter Hedstrom (Hedstroms Motorsport) whose respective day’s came to a halt ahead of the final. Meanwhile, Hedstrom’s team-mate Daniel Thoren walked away unharmed from a sizeable semi-final crash that left his VW Polo heavily damaged. In the final overall standings, Solberg wins the title having accumulated 148 points courtesy of three wins and a total of four podiums and status of having reached the final in each event. 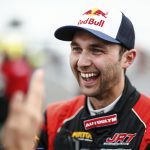 It leaves him 11 and 16 points ahead of Eriksson and outgoing champion Bryntesson, who nonetheless end the year with a win apiece at Kouvola and Holjes respectively. Norway’s Froshaug follows his team-mate in fourth overall, ahead of Hedstrom in fifth place and Carlsson, whose strong end to his debut season yields a top six result overall.